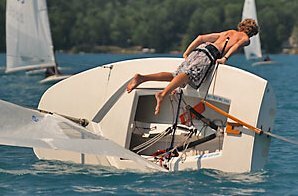 According to Rudy Maxa (Savvy Traveler) sailboat racers in Sidney Australia (long ago) intentionally jettisoned crew members half way through the race. Because it makes physical sense, this strange story may even be true. 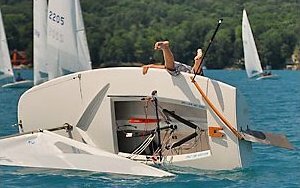 Weight slows a sailboat. Roughly, a 4% increase in total weight (boat plus crew) decreases the downwind speed by about 1%. 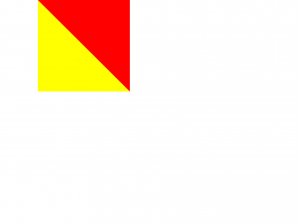 On the other hand, crew weight is needed to balance the boat when sailing upwind. Sailors are faced with a weight dilemma because heavy crew is needed only half the time. There is a way around this weight problem for races where the first half is upwind and the second half is downwind. One simply dumps the crew into the water at the windward mark. The crew takes on additional responsibility; swim to shore or get rescued. 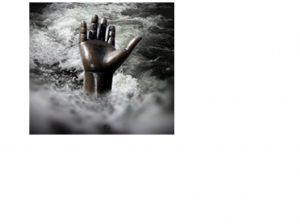 Man overboard, sinking in a sea of love. Man overboard; he jumped, didn’t need a shove. It is clear that a lighter boat will be faster. An estimate that a 4% weight increase leads to a 1% speed decrease is based on some simplifying physical assumptions. They are listerd here. 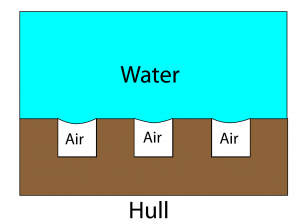 1) Water’s drag force on the hull opposes the driving force of the wind. The water’s drag is equal in magnitude to the wind’s force. 2) The drag is proportional to the submerged cross sectional area of the hull, which is nearly proportional to the total weight. 3) The drag force is also proportional to the square of the boat speed. 4) The total drag force would stay the same if the speed decreased by 2% at the same time that the weight increased by 4%. This follows because a 2% decrease in boat speed corresponds to a 4% decrease in the square of the boat speed. 5) For downwind sailing, slower boat speed means an increased apparent wind speed (with reference to the boat). Combining the decreased boat speed with the increased apparent wind speed means the boat must slow by only about half as much (1%) when its weight is increased by 4%. There are two exotic ways to reduce drag on a sailboat hull. One can add riblets or make the boat sail over a cushion of air. Dennis Conner and his America’s Cup team coated the hull of Stars and Stripes with riblets, which are tiny groves running parallel to the direction of the water flow past the hull. Riblets may have helped the United States re-capture the 1987 America’s Cup. Some have speculated that dolphins’ spectacular swimming speed may be associated with their expulsion of ethylene oxide. This gas would act as a cushion between their skin and the water. Dolphins almost certainly don’t sweat enough gas to make a difference, but the idea of using a gas to reduce drag has been around for a long time. One could put a “bubbler” near the bow of a sailboat. 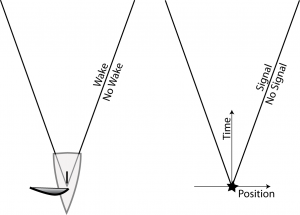 In principle, the boat would then sail over a thin film of air. This would almost certainly be illegal and impractical. Recently, Jonathan Rothstein and others at the University of Massachusetts – Amherst have considered physics related to both riblets and the gas cushion. They measured the drag on a surface with grooves. There is a difference. The groves are filled with air. The air is encouraged to remain in the groves because the solid surface is made of a “super-hydrophobic” material. That means it hates water. Small scale experiments on this structure show a real reduction in surface drag. It is not clear how this drag reduction would scale up to the size of a sailboat hull. It is also far from clear that a finely grooved super-hydrophobic sailboat hull would be practical or affordable, and many would consider it to be unfair competition. The riblets were declared illegal on all racing class sailboats shortly after the 1987 America’s Cup competition.